MediShield Life coverage will start on 1 November 2015. Below is the full press release from the Ministry of Health, Singapore, with the link to the MediShield Life Welcome Booklet at the end. If you still do not know what is MediShield Life, here's a quick update to get you up to speed: What I need to know about MediShield Life and MediShield Life Premiums? 1. From 1 November 2015, all Singapore Citizens (SCs) and Permanent Residents (PRs) will be covered by MediShield Life and benefit from better protection against large healthcare bills for life, regardless of their age or health conditions. This is a major step in strengthening Singapore’s healthcare safety net and providing Singaporeans with peace of mind for high medical bills. 2. When MediShield Life is launched on 1 November 2015, its higher benefits and lifelong protection will kick in immediately for all SCs and PRs, for hospital admissions on or after the date. This includes those who are not covered by insurance today (due to pre-existing conditions, or exceeded the maximum coverage age of 92), and who will now be able to benefit from MediShield Life protection. For those whose existing MediShield or Integrated Shield Plan policies are not yet due for renewal, they will also start enjoying the enhanced MediShield Life benefits from 1 November 2015, but their MediShield Life premiums will only be payable on their next policy renewal date. 3. All Singapore households will receive a MediShield Life Welcome Booklet in August, as part of the Ministry’s ongoing efforts to explain and communicate this important universal scheme to the public, ahead of the launch of MediShield Life. The B5-sized booklet in four official languages will provide information on what MediShield Life is, its benefits, premiums and subsidies, as well as how Integrated Shield Plans work. 4. Each MediShield Life Welcome Booklet will also come with a soft fridge magnet with the MediShield Life hotline and website address. Please refer to Annex A and Annex B for images of the booklet and magnet. 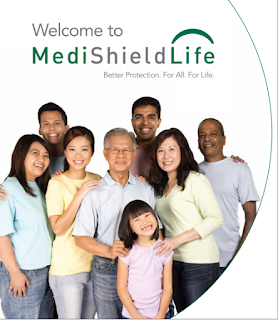 An online copy of the booklet and more information on MediShield Life can be found on www.medishieldlife.sg. 5. Over the next year, the Central Provident Fund (CPF) Board and private insurers will be sending notifications on individuals’ MediShield Life policies and private Integrated Shield Plans, respectively. 6. When MediShield Life is implemented, payers of MediShield Life premiums will receive premium notification letters for their own premiums and subsidies they are eligible for, as well as the premiums and subsidies for those whom they are paying for. The first batch of premium notifications, for policies being renewed on 1 November, will be sent out in late September. Likewise, payers of Integrated Shield Plan premiums will receive premium notification letters from their private insurers before their policies are due for renewal. Those who are currently not insured will receive a letter from the CPF Board in October 2015 to inform them of the start of their MediShield Life coverage from 1 November 2015. 7. An overview of the notifications to be sent out is listed below. Currently uninsured In October 2015, you will receive a letter with details about your new MediShield Life coverage, premiums and subsidies, including whether you have to pay Additional Premiums. The various subsidies for MediShield Life premiums will also apply to Additional Premiums. Currently covered by MediShield only* When your plan is up for annual renewal, the current payer (who may be yourself or your family member) will receive a letter from the CPF Board with details about your MediShield Life premiums and subsidies. Currently covered by an Integrated Shield Plan* When your plan is up for annual renewal, the current payer (who may be yourself or your family member) will receive a letter from your private insurer with details about your premiums and subsidies. You will receive subsidies for the MediShield Life portion of your Integrated Shield Plan if you are eligible. * If you have a serious pre-existing medical condition and have to pay 30% Additional Premiums, you will receive a letter by October 2015. 8. With MediShield Life, individuals with serious pre-existing conditions will have their conditions covered by the scheme. The Government will support the bulk of the cost of universal coverage, while those with serious pre-existing conditions pay a nominal share, through 30% Additional Premiums for 10 years. A fair and compassionate approach will be adopted in determining the serious pre-existing conditions that will be subject to Additional Premiums, and take into account factors such as the specific nature and severity of the individual’s pre-existing medical condition(s). 9. Prior to the launch of MediShield Life, the CPF Board will conduct checks to identify individuals who have serious pre-existing conditions that will be subject to Additional Premiums. To ensure that the process is convenient and minimise the need for further medical assessments or medical reports, the CPF Board will tap on existing medical information in Government administrative databases and with medical institutions. For the uninsured who do not wish to have their medical information checked, they may decline access to their medical information by submitting a form, available on the CPF Board’s website ,by 15 September 2015. The CPF Board will proceed to conduct the checks thereafter, and will inform those who have to pay the Additional Premiums by October 2015. As the CPF Board will not be able to ascertain their medical status, the uninsured who decline access to their medical information will have to pay Additional Premiums, to be fair to the rest of the members who have been assessed and verified to have no serious pre-existing conditions. For individuals currently insured under MediShield or an Integrated Shield Plan, the CPF Board will carry out the checks based on their past records with the Board. 10. MediShield Life premium subsidies will also apply to the Additional Premiums, and MediShield Life premiums may be fully payable by Medisave. Labels: Contact Us, In the news, MediShield, MediShield Life, Singapore Insurance Industry, Singapore Insurance Planning FAQs, Singapore Medical Insurance Planning, What is Medishield?